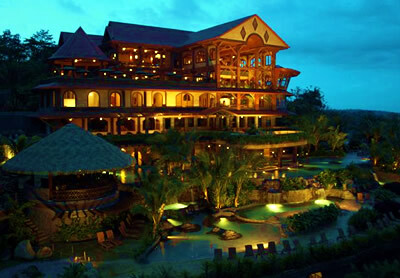 Costa Rica is known as the land of the reasonably priced boutique hotel. But sometimes, it is fun to splurge at a top resort, too. “Over the top”, is exactly how I would describe the new “The Springs Resort and Spa” at Arenal. We did not stay here, but we were invited to use the springs one evening. We went back the next day to tour the grounds and see the suites. This property is owned and was developed by Lee and Cindy Banks, the owners and creators of the La Paz Waterfall Gardens and Peace Lodge. I first met Lee about ten years ago at the yearly tourism convention. He owned the land that was to become La Paz, and had just installed the first paths and walkways. Here was this young guy in probably the worst location in the exhibition hall. But you could tell he was a very dynamic person, very bright, and full of energy. The videos he had of the waterfalls were very impressive, and you could see that he was on to something. Over the years, we have all seen what La Paz has become. Was it possible to improve on La Paz? I would not have thought so. But this is an amazing development. My first impression of the place was that a whole teak forest died to construct the main building. It IS beautiful. I didn’t say anything, but I was a little sad. I perked up when it was pointed out to me that the wood was not teak at all. It was laurel, a local renewable wood. It was just stained to a teak color. The huge planks that supported the stairs, roof, etc. were not wood at all. It was the expertly painted concrete and fiberglass. The color and grain were a perfect match. Seamless. I know that it sounds Disneyish, but they did a great job of it. At least it is sustainable, and keeps the natural feel to the place. They were in a “soft opening”. Many of the amenities were still under construction. Men and women currently share the same spa. But eventually one whole floor (14,000 square feet) of the main building will be dedicated to the health club and separate men and women’s spas. There will be a casino too. Not my favorite activity, but there is a market for that kind of thing. There is a formal restaurant, and a more casual one. But the Springs were amazing. Twelve pools in all, with more on the way. Yes, this place is open to the public for day trips. But I don’t see it becoming as crowded as the other springs in the area. The pools are split between some modern ones of different temperatures, including one with a swim up bar. There are several more natural appearing pools with waterfalls, in the woods. These were our favorites. There are several different room classes. From beautiful standard doubles, to full blown villas. All high end, and very well done. This is not a cheap option by any means. Rates start at $375.00 per night in high season, and go all the way up to $1400.00 for two attached villas. The admission for a day package at the springs is $40.00 per person. Meals and beverages are extra. They are also opening a wild cat exhibit soon, and this will be included in the day package. There was a shelter that was being closed near San Jose. These were animals that for one reason or another could not be released in the wild. There was a fear that the animals were going to be destroyed. The owners here stepped in, and are putting the finishing touches on an exhibit of these beautiful creatures. In short, I think that the day package is definitely worth it. The rooms are worth the price, but not in everyone’s budget. Like the Peace Lodge, these will be great for honeymooners or just as a splurge. But even at this price point, I think they are a good value.